To mark the 500th bird of the week, here is a rather special tern from New Zealand, the Black-fronted Tern, which I photographed while on the quest for the very special Black Stilt. 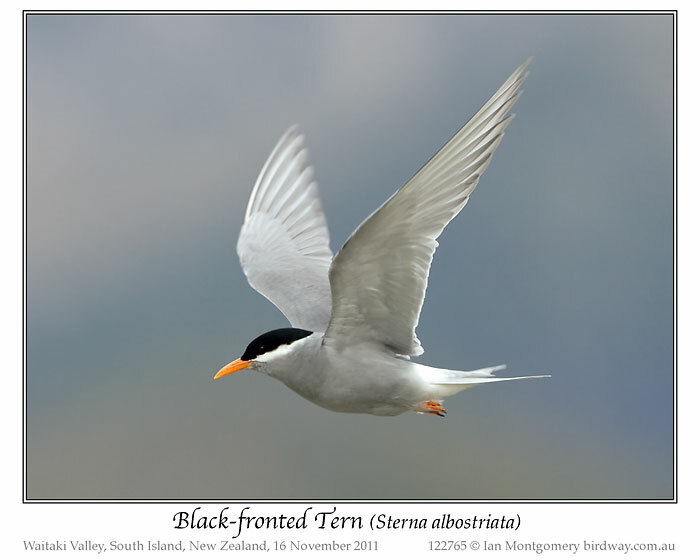 The tern is special, as it’s a New Zealand endemic, attractive and, unfortunately, endangered. The first photo shows a bird incubating at a typical nesting site on the gravelly bank of one of the branching – ‘braided’ – rivers in the Waitaki Valley on the South Island. The second photo shows another incubating bird at the same colony four days earlier, when I found the sole Black Stilt. The plant with the palmate leaves is feral Lupin, one of the threats that this species faces, in this case by encroaching on the nesting sites. I took these photos from a sufficient distance with a 500mm lens so as not to disturb incubating birds, but like many terns they are quite aggressive and other non-incubating individuals like those in the third and fourth photos showed me how unwelcome I was by flying intimidatingly close to me and calling harshly. They look very smart in breeding plumage with sharp black caps, bright orange bills and legs, and white cheek stripe and rump contrasting with otherwise grey plumage. They’re quite small, 30cm/12in in length, with, by tern standards, quite short tail streamers. In non-breeding plumage, the cap is grey, streaky and less extensive and the orange of the bill and legs is paler. In the breeding season, this is an inland species, nesting only along the rivers of the South Island, though it used to breed on the North Island. 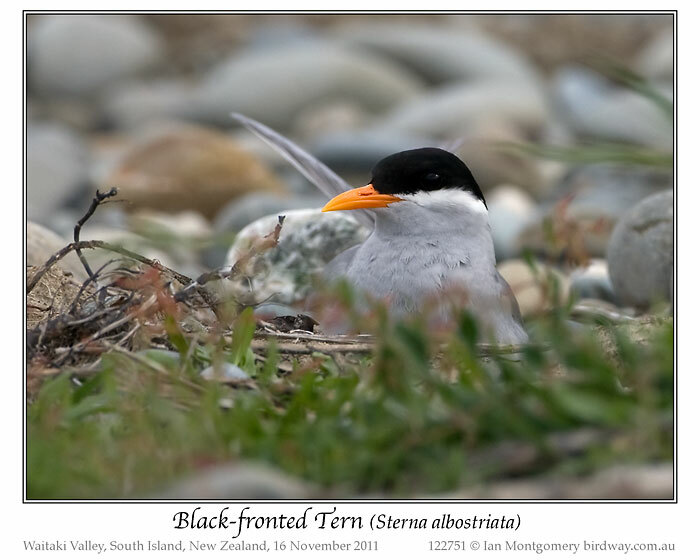 Outside the breeding season, the birds disperse to coastal waters with some reaching Stewart Island in the south and North Island but don’t travel far and have never been recorded in Australia. They feed on small fish invertebrates mostly snatched in flight either from the water surface or the ground – they will follow ploughs – and will also plunge into water to catch fish. The population is estimated at about 5,000 individuals and declining, hence its endangered status. Main threats to the population are predation by introduced mammals particular stoats and weasels, feral weeds, disturbance by people and stock and hydroelectric schemes. Breeding success appears to be low, but colonies do respond well to conservation measures such as protection of nesting sites, removal of weeds by spraying and provision of artificial nesting sites such as rafts. 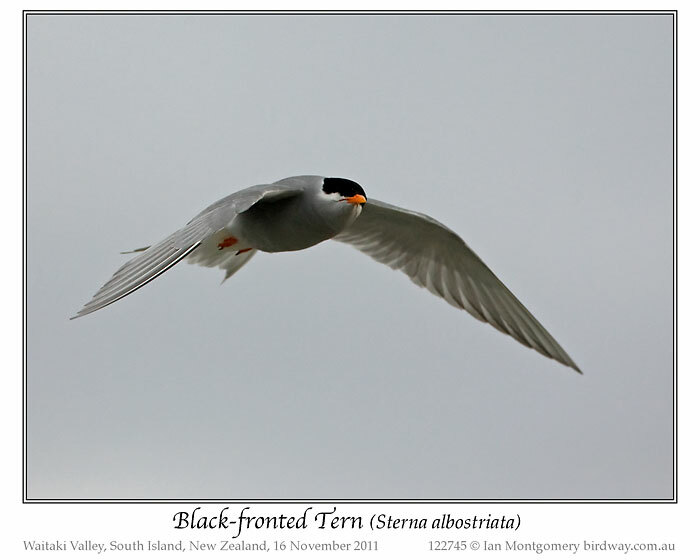 The Black-fronted is one of two endemic New Zealand terns, the other being the marine White-fronted. It’s considered a close relative of the Roseate Tern is quite abundant and many migrate to southeastern Australia in winter. 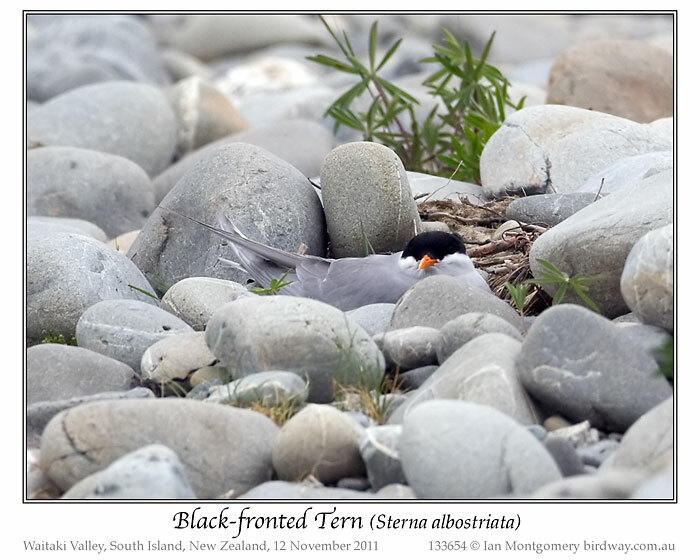 Ian has again introduced us to another neat creation, the Black-fronted Tern. In that second photo, notice how well it blends in with the terrain. What a graceful looking bird. Terns and Sea Gulls both belong to the Laridae – Gulls, Terns & Skimmers Family. 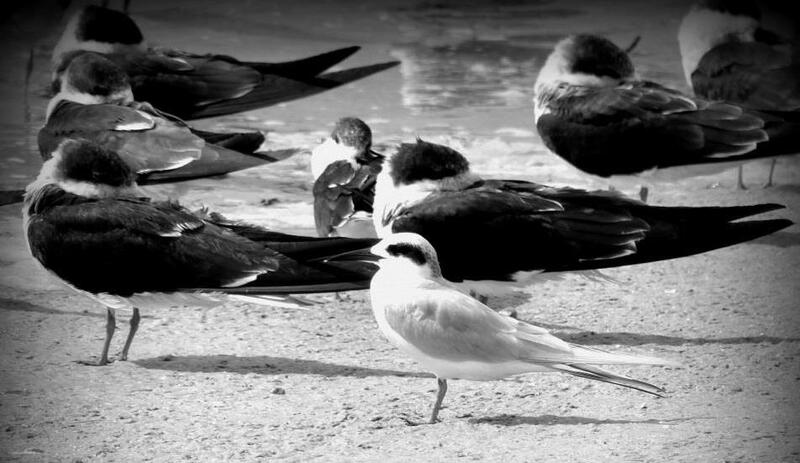 Ian mentioned three of the Terns on his website, but he has plenty more photos fo that family. Check out his Laridae Family which he breaks up into Laridae – Tribe: Sternini & Rynchopini (Terns and Noddies) and Laridae – Tribe: Larini (Gulls and Kittywakes). Another species on my photo list on Norfolk Island was the (Common) White Tern. I’d admired on Lord Howe Island more than twenty years ago, before I got seriously into bird photography. They’re only Common if you’re on a remote coral or rocky island in the Pacific, Indian and Atlantic Oceans, but the label really means ‘standard’ and reflects a split of the species, not universally recognised, into ‘Standard’ and Little White Tern. It used to have the attractive name ‘White Noddy’, until some prosaic purist decided that only terns belong the genus Anous were real Noddies. They are unusually looking terns, with a pointy, slightly upturned bill and very white, actually translucent, feathers, usually described as ‘ethereal’. Seen against the sunlight, the effect is something like looking at an X-ray as in the second photo. In this one, you can see the bill is very thin laterally so it is shaped more like a pair of scissors. White Terns are numerous on Norfolk Island and as they nest on the branches of Norfolk Island Pines, you see them all over the island. If you’re used to seeing terns near water, it’s initially slightly disconcerting to see them flying around in forest. Many of these are parents feeding young, but do also see pairs or small groups of birds, as in the third photo, and very pretty they are too. In March, the breeding season is nearly over, but there are still some hungry and very bored looking chicks in the pines waiting for a feed. The single egg is laid precariously in a concavity on a branch or palm frond. Norfolk Island pines, with their horizontal limbs, are ideal for this and the recent establishment of breeding White Terns on Lord Howe Island can probably be attributed to the introduction of Norfolk Island Pines. The fourth photo shows a nearly fledged juvenile. At this age they look like furry toys, but the slightly younger ones, that were just losing the last traces of their down, often looked quite comical. The bird in the fifth photo shows one that looks for all the world like an aged goddess of the silver screen who doesn’t believe in growing old gracefully, with faux eye-lashes, smudged mascara, thinning hair, an ancient fur coat and a grumpy expression. Hopefully, though, it has a bright future ahead. What a description of the that last photos. Puts a chuckle in you. What is so amazing is that it fits. Anyway, Terns are in the Laridae – Gulls, Terns and Skimmers Family and see Ian’s Laridae Family of photos at his Birdway site. More of his photos of the Common White Tern can be Here. “The White Tern (Gygis alba) is a small seabird found across the tropical oceans of the world. It is sometimes known as the Fairy Tern although this name is potentially confusing as it is the common name of the Fairy Tern Sternula nereis. Other names for the species include Angel Tern and White Noddy. Looks like the Lord, in his creation of these chicks, provided feet that can help them hold on. The weather is improving here, so I went birding a couple of times last week. The first time I went to Hodel Road, Giru, just south of Townsville, which goes through an area of marshy coastal grassland that can turn up interesting birds. 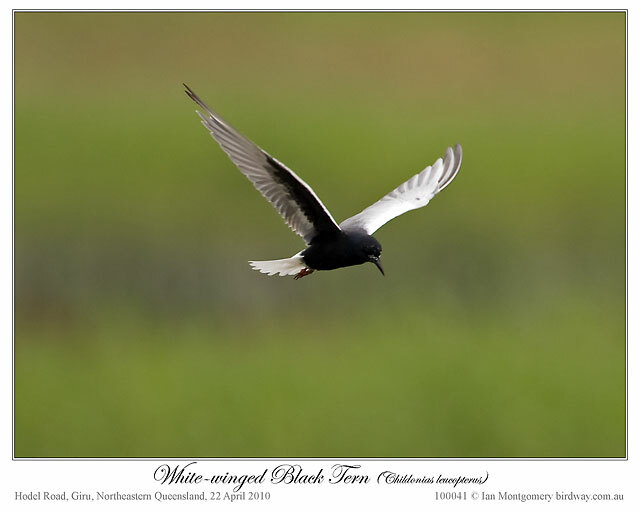 At this time of the year, it can be good for White-winged (Black) Terns starting the migration back to the northern hemisphere and some, like the one in the first photo, may be in the unmistakable breeding plumage, with black bodies and pale wings. I’ve bracketed (Black) as this qualifier is usually added in Australia, while Birdlife International calls it just ‘White-winged Tern’. 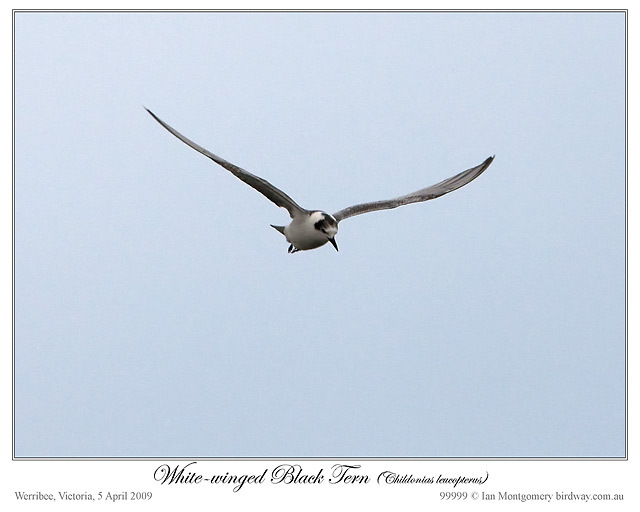 More usually in Australia, we see White-winged Black Terns in non-breeding plumage – like the one in the second photo – and care needs to be taken to distinguish them from the related, slightly larger, Whiskered Tern in the same plumage. Perhaps the best field mark is the shape of the black band on the head. In the White-winged Tern it forms a vertical hoop over the crown of the head; in the Whiskered Tern it forms a horizontal hoop around the nape and the crown is whitish. There are also differences in the patterns of the upper wing. In the White-winged the dark leading edge (visible in the second photo) and the whitish rump gives the bird a patchier appearance than that of the more homogeneous Whiskered. Some points that may be of interested to bird photographers relate to birds in flight coming towards the camera and to backgrounds. Telephoto lenses have very a shallow field of view, particularly at the high shutter speed/large aperture combination necessary to freeze the motion of the bird. This means that even if the auto-focus has operated correctly, the bird may have moved out of focus during the lag while the photo is taken. Some cameras have an autofocus option to compensate for constant movement, called ‘AI-Servo’ on Canon SLRs, and this is the occasion to use it. The problem with backgrounds is that the autofocus may miss the bird and grab the background instead. Birds against the sky are easier than against the ground – unless there are clouds with high contrast. Practicing tracking birds in flight is the solution here, and I use a single focus point in the centre of the viewfinder. This gives much more control over auto-focusing and not only with birds in flight but also in spatially complex shots such as a bird in a tree with branches around it. On the website, I’ve been experimenting with changes to the layout of bird photos. The changes involve technical aspects such as getting rid of frames, but the advantages from a user’s point of view include being able to bookmark individual photos (rather than just species), and scroll bars to prevent thumbnails extending way below the window. If you’re interested, have a look at http://www.birdway.com.au/otididae/australian_bustard/source/australian_bustard_99577.htm – I’d welcome your feedback. The White-winged (Black) Tern is in the Laridae Family of the Charadriiformes Order. There are 102 members of the family. Only 39 of those are Terns, the rest are Gulls, Noddy, Skimmers, and Kittiwakes. They are small terns generally found in or near bodies of fresh water across from Southeastern Europe east to Australia. Their behavior like the other “marsh” terns (Chlidonias), and unlike the “white” (Sterna) terns, these birds do not dive for fish, but fly slowly over the water to surface-pick items on the surface and catch insects in flight. They mainly eat insects and small fish. In flight, the build appears thick-set. The wing-beats are shallow and leisurely. The White-winged (Black) Tern is another of the neatly created birds which shows the Handiwork of God. Graceful, water-loving aerialists, gulls and terns are constant companions at the water’s edge. Rather than an exhaustive identification seminar, this video focuses on the range of variation within this elegant group.